Celery has, to us, a very nice flavor, but one of us at least regards the strings and the texture as a fatal flaw. Celeriac has the wanted flavor and a nice texture. One has to imagine that it’s the pre-cutting look of this extraordinarily ugly little ball of roots (someone has called it “the vegetable octopus“) that has kept it from its deserved prominence. It’s not a great vegetable, but it’s a quite good one. As with too many good and useful vegetables, Celeriac seems only rarely to be discussed by cultivar, though if one hunts around one can eventually find quite a few types being marketed by seedsmen (but few carry more than one or two kinds each). Truth to tell, there seems little information—other than the claims in seedsmen’s catalogues—on which to make a choice of cultivar; though many catalogues list only a generic type, there are surprisingly many named cultivars available to the diligent home gardener (one Polish seedsman offers five varieties, none found, by us, elsewhere). Prinz: Compact plant. Healthy foliage. Deep globe, smooth, white skinned. Monarch: Attractive white skinned, smooth, deep globes. Good interior. Healthy, attractive foliage. Rowena: Attractive, uniform crop of white skinned, deep globes. Healthy, attractive foliage. Neon: Deep globe, slightly oval. Smooth, white skinned variety, attractive. Healthy mid-sized foliage. Cisko: Vigorous plant producing deep, white skinned globes. Smooth skin, dense interior. Healthy foliage. As a practical matter for U.S. gardeners, of those types listed above, only the Prinz and Monarch cultivars seem available on this side of the Atlantic, and neither is exactly common among seedsmen; either would be satisfactory. But what we decided on, after review, is a type called Tellus (not in the RHS trial). One always takes seedsmen’s encomia with a grain or two of salt, but our supplier's catalogue says “Most modern celeriac has been bred to have a bright white interior, which is better for looks. Unfortunately, the volatile compounds that give off such a delightful flavor also stain brown when cut. Tellus has a true celeriac flavor because it has not had the flavor bred out of it.” Other sources cite its smoother skin (a real plus with these guys), relatively rapid growth, and that its flesh does not discolor even when boiled (though that’s a terible way to cook this or almost any vegetable). “Information“ on celeriac culture shows hugely divergent and often quite contradictory kinds of advice. Apparently, it can be direct-seeded, but—especially in commercial practice—is started as indoor seedlings because the seed is tiny and hard to handle outdoors, the soil needs to be kept carefully and continually moist till emergence, the germination period is quite long (three to four weeks from sowing to full emergence), and the required growing period is very long—six to seven months. The home gardener is, we think, wise to this time follow commercial practice and start seedlings for transplanting. Timing is crucial with celeriac, because it is by nature a biennial. If your transplants see more than perhaps a week or so of cool temperatures—anything below about 55°—they “think“ winter has come; then, when it turns warmer with summer, they “think“ they’re already into their second year, and all their growth energy goes into the above-ground parts instead of the root, which is what we want. On the other hand, they like cooler weather for growing, so we don’t start them as early as we can, lest they see the peak of summer while still mere transplants. They spend a lot of time as seedlings, circa three months, and another four or so months (110 days for Tellus) outdoors. Celeriac can apparently take—and possibly even be immproved by—an early light frost or two, but it can’t take hard freezes. If we want to harvest before the likelihood of killing frosts, early to middle October is the cutoff; thus, we sow April 4th for transplanting out around June 27th, when—we hope!—it’s not too cool and not too hot, with harvest to follow in mid-Octobber or so (though we can let them stay in till a killing frost seems imminent). But—heads up here!—you need to consider your own microclimate carefully and perhaps move those dates around by a week or two either way as circumstances and your climate records call for. As we said above, it is very important (as with beets) to keep the soil about planted seeds continually moist till it germinates (and thereafter, for that matter). Be sure throughout to cultivate thoroughly but carefully, so as to keep the area weed-free without damaging the tiny plants. Celeriac is a heavy feeder, and so grows best in soil that has been generously amended with plenty of compost or well-composted manure. Soil with good drainage is wanted, preferably a sandy or clay loam. Some sources suggest a low pH, around 6.0, but the plants will probably do well anywhere in the usual 6.5 to 6.8 garden-soil range. 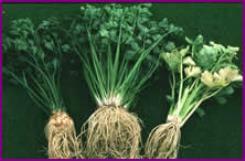 Jeavons recommends a deep-bed spacing of 6 inches for celery itself; for celeriac, it depends on at what stage you want to harvest. If you plan on harvesting early, as little as 4 inches may suffice; if you want to let them go on and on, you might need as much as 8 inches. Make your own call. Celeriac loves wet soil. You cannot water it too much, and a thick layer of mulch will help tremendously in keeping the soil suitably moist. Inadequate or irregular watering can lead to hollow roots or bolting. Because celeriac does not compete well with weeds, cultivate around it conscientiously, but carefully (do not disturb its shallow roots). As the root develops, snip off side roots and hill the soil over the developing root. Side dressing periodically during the growing season with an organic fertilizer high in nitrogen is also helpful, but don’t overdo it, because that will encourage leaf, rather than root, growth. Celeriac, like many “roots“, is a long-season, cool-weather crop; it is slow-growing, taking typically seven months from seeding to full maturity (that is, about four months from transplanting), though the root is edible at any earlier stage. As a rule, the longer you leave celeriac in the garden, the larger the root gets; some say they seldom get woody when large, while others say harvest when small (circa 4-inch diameter) lest they become woody—ya pays yer money and ya takes yer chances. Likewise, some say celeriac is frost-tender, while others say a few light frosts won’t bother it (some even say it helps its flavor). Probably most accurate is the statement “celeriac increases in flavor after the first frost, but it should be harvested before the first hard freeze.“ (Where winters aren’t deadly, folk leave them in the ground over-winter, harvesting as needed till the next bunch of transplants is ready.) Also, some recommend drawing soil up around the stems in early autumn, to blanch them; others don’t bother. Celeriac (like celery) is another from that wonderful family of useful root crops, the Umbellifrae, that also includes carrots, parsley (including rooted parsley), parsnip, fennel, dill, coriander, and some other less-common herbs. Umbellifrae are easily recognized by their characteristic lacy top growth. The early history of celeriac is the history of celery. Native to the Mediterranean region, celery in its wild form is called smallage. Evidences of cultivated celery have been found in Egyptian graves from circa 1100 B.C. The Greeks called it selinon, and as such it is mentioned in Homer’s Odyssey, dating from 850 BC. It is reported that the Greeks gave celery wine to winning athletes—celery “elixir“ or “tonic“ has long been thought to have pronounced medicinal benefits, and indeed, before the 16th century or so, celery was pretty much used exclusively as a medicinal plant. It is only in 1543 that one finds a distinction being made between celery and celery root, or celeriac. There remains to this day a small but steady and zealous following for that curious beverage, little known outside New York City, “Dr. Brown’s Cel-Ray“, which is basically just celery soda pop. It is, as a bearded gent used to say of a different soda product, “Curiously refreshing“. You loaded this page on Friday, 19 April 2019, at 17:06 EDT. It was last modified on Tuesday, 29 January 2019, at 01:47 EST.